Sixteen teams already classified, eight still in the game! Thursday, 16th August, was an intensive day, where we could see all the teams in action for the last time. There were many emotions and surprising results, after which we got to know the winners of the President’s Cup and four semi-finals equipes of the World Championship in Poland! After quite one-sided game the President’s Cup was won by Montenegro. 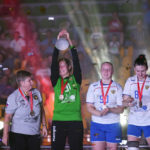 The trophy was given to the captain of the team by the member of the IHF Executive Committee, Narcis Lecusanu and the vice-president of the PHF, Zygfryd Kuchta. 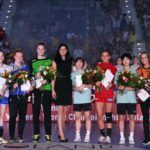 Sweden, Russia, Hungary and Korea will play in the Saturday’s semi-finals, while Nedherlands, Denmark, Spain and Germany will take part in placement matches 5-8. The weekend rivalry will take place in the Hall Legionów only. The winners will play for the 5. place and the losers for the 7. place on Sunday. The winners will fight for the gold medals and the losers for the bronze ones. NextEach of us has a superhero. The Championships have VOLUNTEERS! Spain with third place in group D!